Lovely home built in 2002 on quiet street. Wide sandy-white beach great for long walks and sandcastle building. Great fishing in front of house. Five deep-well marinas, great restaurants, and a small town for shopping are within two miles. This home has been well stocked for gourmet cooking. Easily accommodates a large crowd. The ten-foot by 32-foot, screened porch is ideal for breakfast, or reading a good book. Six TVs, a stereo and 3-DVD players, add to your entertainment. An upstairs bedroom is also a TV room for the children. A hot-and-cold shower outside is great for after beach activities. Visit nearby Apalachicola to see historic homes, museums, shops, and great restaurants. St. James Bay, A beautiful new golf Course is five miles away in Lanark. The house was perfect. It accommodated a large group with plenty of room! The beach was nice, quiet, and perfect for the kiddos. Sitting on the back porch and listening to the waves was very relaxing. 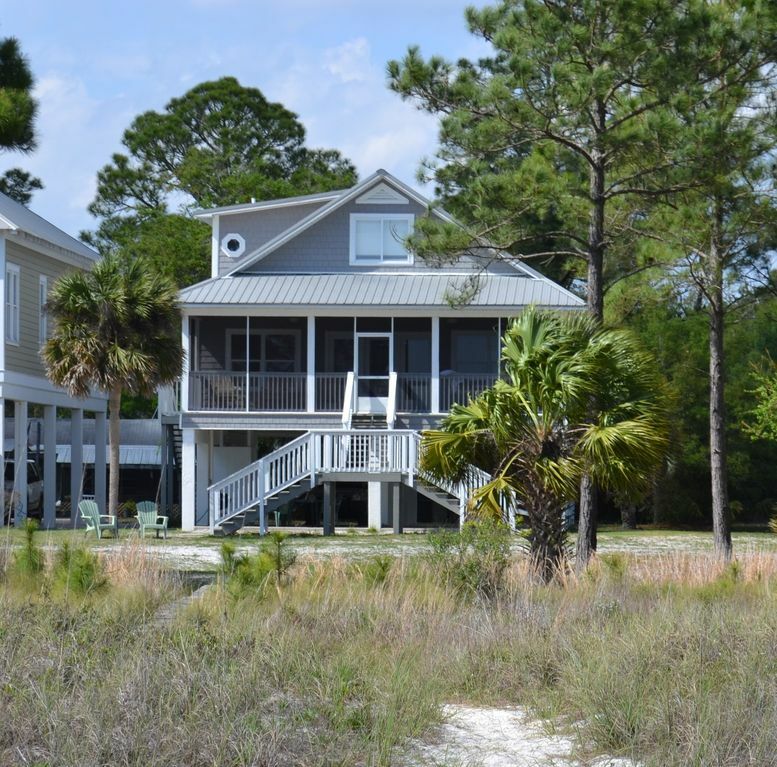 Overall, we had an amazing stay in Carrabelle and in this beautiful home! We will definitely be happy to come back on our later Florida trips! Thank you so much! Glad you had a nice time. We had a great time at Sea Palms. The house was clean and had everything we needed in the kitchen and for the beach. It was a great location. The ocean water was very calm which was good for our young children. We saw dolphins every day and even saw a sting ray giving birth! For larger waves we went to St Georges Island for the day. We went to Apalachacola for our rainy day and went to the free estuary museum and did some shopping. It was a great low key, relaxing vacation and we would love to come back again! Thank you for the kind words. So glad you had a nice vacation. Please come again soon! This has been our fourth year staying at Sea Palms. House is very clean and well appointed. Owner is extremely responsive and wonderful to communicate with. We have already booked for next summer. I simply cannot say enough nice things about this home. Beach is perfect and secluded. Convenient location and lots of wildlife to boot! Everyone had a great experience from my 92 year old grandmother to my youngest 7 year old son! Memories made for years to come. Cannot wait for next year!! Thank you Em. So glad you had a good time. Looking forward to next year! Great location for quiet vacation. Fabulous house, fabulous beach. Thank you Betsy. Please come back anytime! Perfect for our family of nine! We are very thankful that we could spend Christmas 2017 with our whole family. The five bedrooms were perfect for all of us. We had our meals at the house everyday and the kitchen had everything we needed. The short walk to the beach was great and playing football and other outdoor games right out behind the house was a lot of fun. We enjoyed a trip to St. George Island and the fresh shrimp and especially the huge scallops that we bought from the truck on the island were oh so good. We were very pleased. Thank you for sharing your beautiful home. So glad you enjoyed the house! Thank you so much!